The biggest setback in making a paleo, low-carb, or keto pumpkin pie is the crust. So, let’s ditch the crust. The filling is where it’s at anyway, right? And who could say no to a pumpkin “pie” topped with toasted marshmallow fluff? The answer is NO ONE. This recipe is from my newest book, The Big Book of Paleo Pressure Cooking that releases tomorrow! I’ve been meaning to post some peeks from my book, and I fully intend to do that. Meanwhile, you can enter to win one of FIVE copies of my book over on my Instagram account! Every time I have a spare minute or a block of time I set aside to work on blog-related things I suddenly get a text that someone wants to see our house, so I have to clean it up AGAIN. You’d think the level of cleanliness would improve because of our constant need to clean, but four kids kind of blows that theory out of the water. Sigh. Anyway. 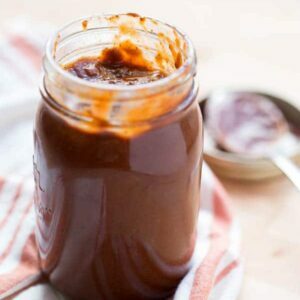 One of the most delightful things I learned after using my Instant Pot for a few years is that you can use ramekins or small mason jars to make cute little desserts! Custards and things like this work BEAUTIFULLY in an electric pressure cooker because of the steamy, hot environment inside the cooker. 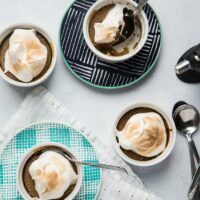 In addition to these Crustless Chai Pumpkin Pie Cups (that can easily be made low carb or keto!) I included a few other ramekin/mason jar friendly desserts in my cookbook. Like Brown Sugar Peach Mug Cakes, Salted Caramel Coconut Flan, Peppermint Pots de Creme, and “Peanut” Butter Cup Lava Cakes. Ok, back to the recipe. Let’s talk about this Low-Carb Marshmallow Fluff for a second. It turns out that low-carb granulated sweetener (like Swerve) makes some pretty fantastic marshmallow fluff/meringue type of topping. And it’s even better if you can torch it with a small kitchen torch. Do you have one? Mine came with a creme brulee kit I bought on clearance at Target 10+ years ago after Christmas. I linked to a similar one that’s probably a little nicer than my super cheap one. Honestly I’m surprised it has lasted this long! You’ll also need a set of 6-ounce ramekins, which are inexpensive and easy to find. You can also use pint-sized mason jars. 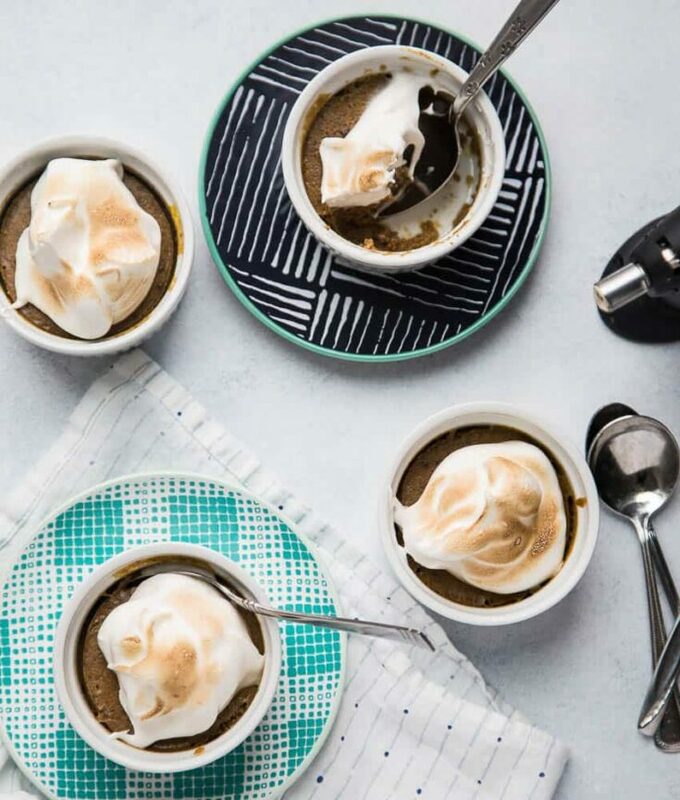 And can we also talk about the chai spice in these pumpkin pie cups? My Homemade Chai Spice isn’t made of tea or anything. It’s just a mixture of the spices that make chai tea so spectacular — baking spices mixed with a little pepper and coriander. And a couple of other things. 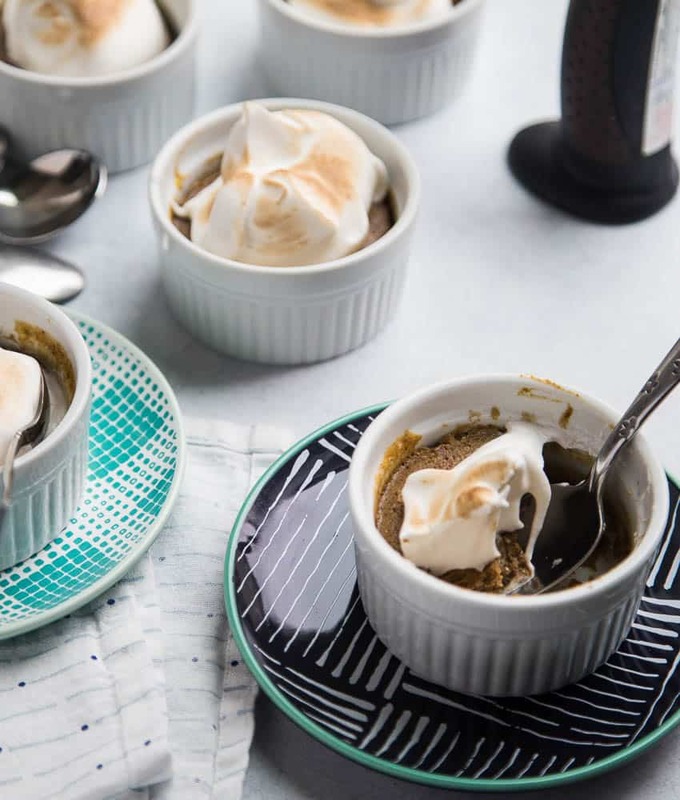 ANYWAY, grab your ramekins, get a torch (if you haven’t yet), and make these super fun Crustless Pumpkin Pie Cups for Thanksgiving. 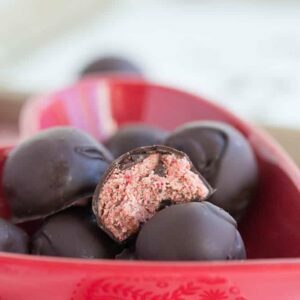 While you’re at it, grab a copy of The Big Book of Paleo Pressure Cooking so you can use those ramekins on the regular and always have some healthy desserts on hand. And head over to my Instagram account before Wednesday November 21st and enter to win a copy of my book! The biggest setback in making a paleo, low-carb, or keto pumpkin pie is the crust. 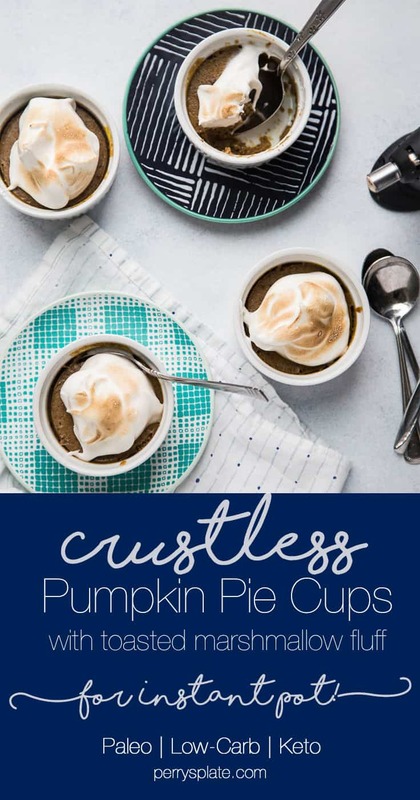 So, let's ditch the crust and make some crustless pumpkin pie cups! The toasted marshmallow topping makes it extra special. Whisk together all of the ingredients in a medium bowl or a large glass measuring cup. Prepare the ramekins with nonstick spray. Pour about 1/2 cup of the mixture into each ramekin. Cover each ramekin tightly with a small piece of aluminum foil. Pour a cup of water and the wire rack into the insert pot of your pressure cooker. Put three ramekins on the rack. If you have another similar rack, place it on top of the ramekins and stack the other ramekins on top. Close the lid and the steam valve. Set the cooker to high pressure for 8 minutes. Let the cooker release pressure naturally for 15 minutes before releasing any remaining pressure manually. Carefully remove the ramekins from the cooker and let them sit, covered, until they’re cool enough to handle. Transfer them to the fridge and chill for at least 4 hour or until completely cold. 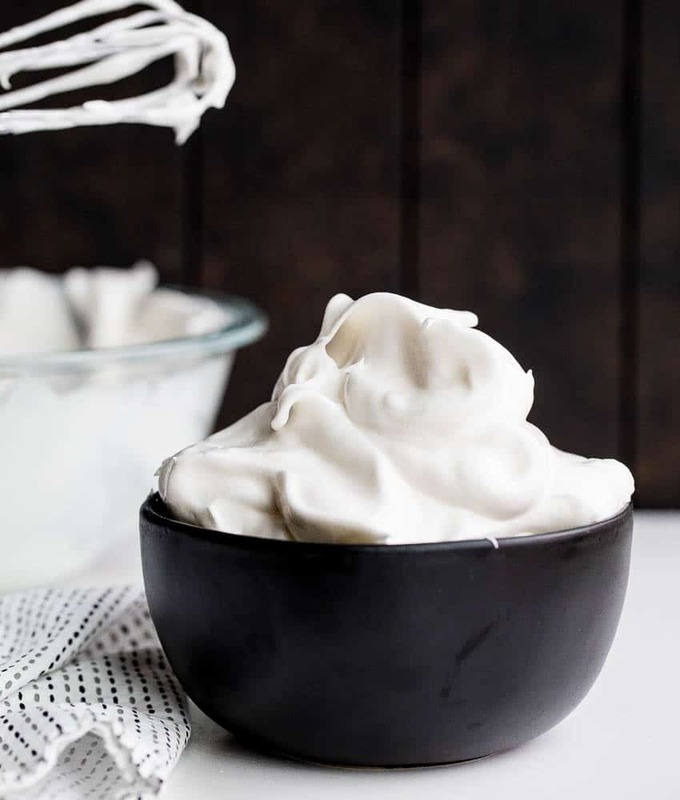 A few minutes before you're ready to serve the cups, make the fluff by putting the egg whites, sweetener, and cream of tartar in a large heat-safe bowl. Place that bowl on a saucepan with an inch or two of water in the bottom. Cook over medium-high heat, whisking, until the sweetener is dissolved and the mixture is warm to the touch. Transfer the bowl to a flat work space and beat with a hand-held mixture for about 5-7 minutes until the whites are fluffy and soft peaks form. Add the vanilla and salt and beat until combined. Immediately top each cup with a big spoonful of the marshmallow fluff and toast it with a hand-held kitchen torch or under an oven broiler for just a few minutes. 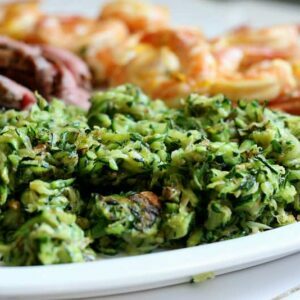 Next Post »My New Paleo Instant Pot Cookbook!